The Church in the Darkness has a lot of cool gameplay ideas alongside an intriguing narrative that’s set in a unique location. It was one of the more unique titles I got my hands on at PAX East because I haven’t necessarily played many things like it. Players will have to get through the game multiple times to experience every unique story and outcomes it has to offer, and that might be one of the best things about it. The title is set in South America during the 1970s, where you play as an ex-law enforcement officer named Vic. Your objective is to investigate a cult called the Collective Justice Mission, led by a couple named Isaac and Rebecca Walker, to check on your nephew Alex, who is a member of the cult. 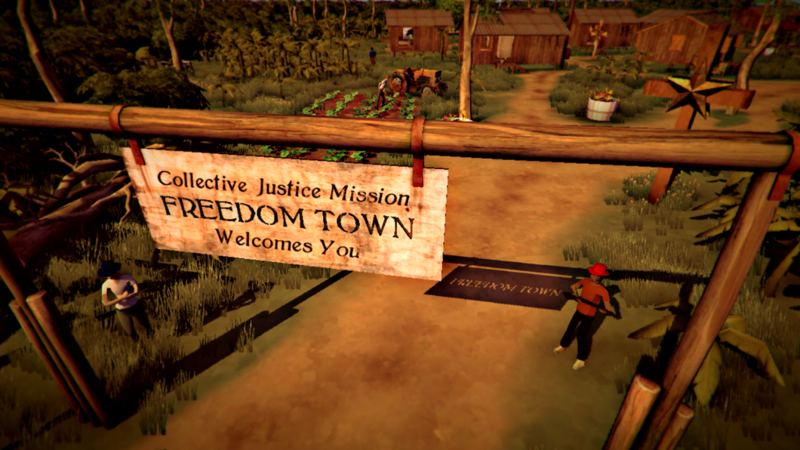 The Collective Justice Mission fled the United States after fleeing from persecution by the government. Rebecca is voiced by Ellen McLain (GLaDOS from Portal) and Isaac is voiced by John Patrick Lowrie (the Sniper from Team Fortress 2), so I’ll be curious to see how each actor’s performance can help elevate the multiple storylines that are in the game. 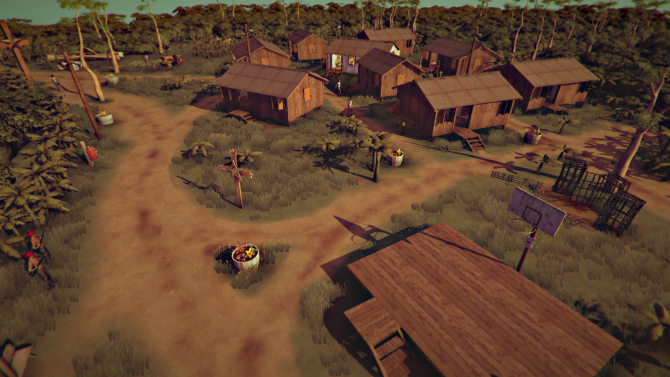 Each playthrough of The Church in the Darkness will change and Freedom Town, the setting of the game, will look different based on whatever scenario you get. There aren’t an endless amount of stories to be told but the game is definitely meant to be played through a good amount of times. Sometimes the cult might be bad, and sometimes they could be good — who knows what other sort of outcomes await. You can also find a whole bunch of different clues that’ll give you more information on the cult hidden throughout the entirety of the game’s world. The camera has you looking from a top-down perspective, and you can use the analog stick to move the camera a little bit away from you and assess whatever’s ahead of you on the map. There’s also a mechanic that allows you to check each enemy’s line of sight. Some mechanics that are meant to help the player will get stripped away at higher difficulties, so players that want more of a challenge definitely have some options. I found going with a stealthier approach was more effective for me than going in guns blazing. Although I only had access to a pistol for most of my time with the demo I played, it didn’t really do ideal damage to enemies. There are other stronger guns that you can find, but ammo will be limited. You’re also able to hide bodies, similar to how it’d be done in games from the Hitman and Splinter Cell series. There are a lot of areas on the map that I didn’t get the chance to explore. What I did see was pretty much what you’d expect to find in a town that’s located in the middle of a jungle; lots of small buildings and farm areas with animals. Throughout each location I explored, there were loudspeakers that are consistently broadcasting different messages from Isaac and Rebecca. I’ll be curious to explore the other areas I didn’t get a chance to see and how they changed based on each scenario once the final game releases. I think the biggest challenge that The Church in the Darkness could face is being refreshing to players after each playthrough, although I think it’s worth mentioning that the game gives players the option to experience a new scenario every time they start over again. I don’t think I’ve seen close to everything that The Church in the Darkness has to offer and I’m intrigued thinking about how each separate playthrough could change things up. The game has a solid voice cast and is set during a time period that makes sense for its subject matter, I’m hoping it all comes together in the end result. 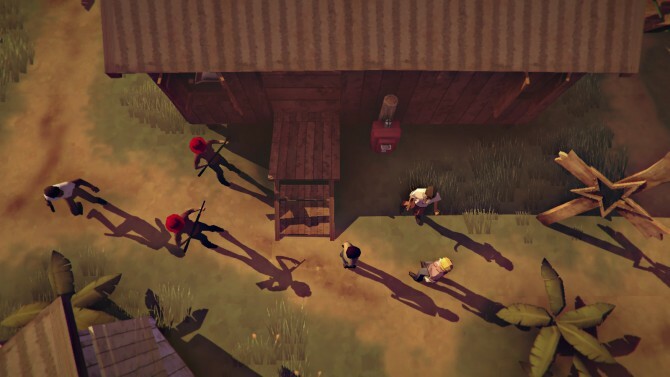 There will be no shortage of platforms to check out The Church in the Darkness on as the title is coming to PC, PS4, and Xbox One sometime this year. While I only got to sit down with the game for a short period of time, I definitely noticed that it’s trying to take an experimental approach to storytelling. If you’re interested in story-driven games or action-infiltration you should definitely keep an eye out for The Church in the Darkness.